As I mentioned yesterday, on Sunday morning we picked up a sweet pasta maker for $2 from a garage sale. $2 people! (I have just googled said pasta maker, and it may or may not sell for $85 in stores). Pretty much from the moment I bought the pasta maker, all I could think of was homemade pasta. Unfortunately (or fortunately, depending on your perspective) we had dinner plans at The Eatery on Sunday night (and it was fun and delicious) so it wasn’t until Monday night that I got to try out our brand new pasta maker. 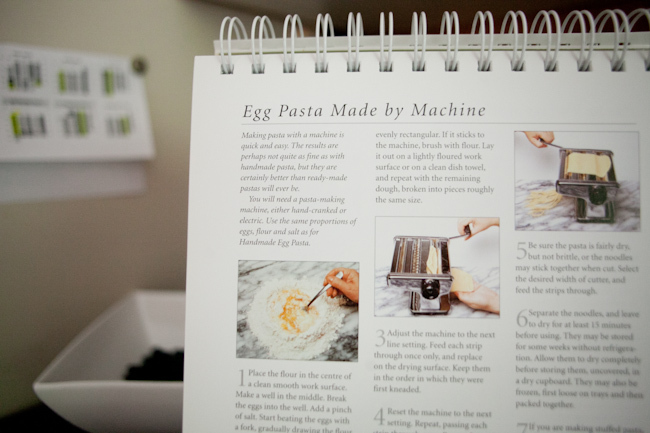 At that same garage sale, the hubs noticed a pasta cookbook; in flipping through it he also noticed that there was a recipe & instructions for how to use a pasta maker. Since neither of us has ever used such a machine before, we decided to splurge and buy the book as well (ok… maybe not splurge, the book only cost $0.50). So. What do you need to make egg pasta? Eggs, flour, and a pinch of salt. Seriously. That’s it. A machine helps, but is not necessary. 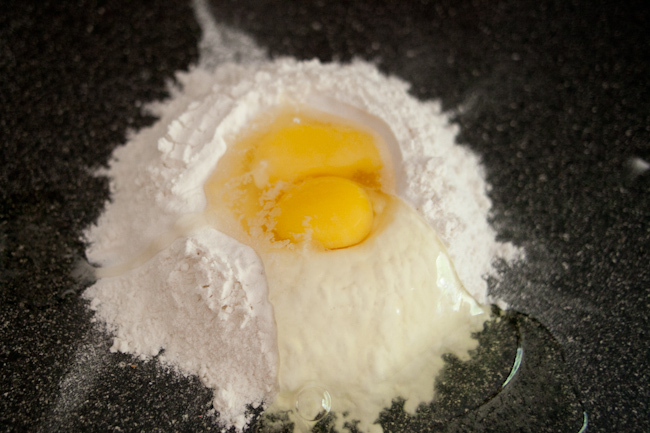 To make egg pasta by machine, you simply pile your flour on the counter, make a well in it, break the eggs into the well, add a pinch of salt, and start beating with a fork. This may sound simple, but when your eggs overflow your well, well… it gets a little crazy. This process takes 2 (and sometimes 4) hands, so I don’t have a ton (ok, any) images of the pasta making process. At then end of it, my kitchen looked like this. After beating the eggs for a bit with a fork, you start mixing with your hands adding in as much flour from the well as needed until the mixture forms a “mass” (seriously, this is how it is described in my cookbook). You’ll know you’ve added enough flour once the mass stops sticking to your hands. Then the fun part begins! You get to roll your dough over and over and over and over and over and over and over through the rollers of your pasta machine at decreasing thickness settings until your dough reaches the desired thickness. The pasta strips get longer and longer and longer (which is pretty fun), but once they get unruly you can cut them in half. Then you get to roll it through the cutting setting; my machine comes with a wide (fettucine—6mm) and a narrow (tagliolini—1.5mm) setting. I love me some fettucine, so that was my choice for pasta number 1! And boy, did it ever look awesome! The best thing about fresh pasta? It cooks in about 30 seconds! 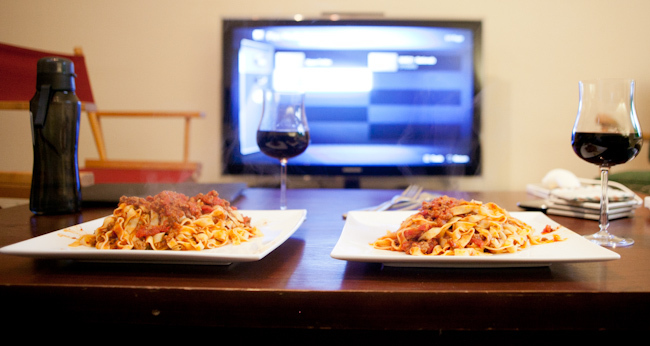 We combined our fresh pasta with some delicious leftover homemade sauce from a few weeks ago and enjoyed it while watching TV. Seriously people, after making and cooking for all that time, all I wanted to do was the veg with my comfort food. So. Delicious. 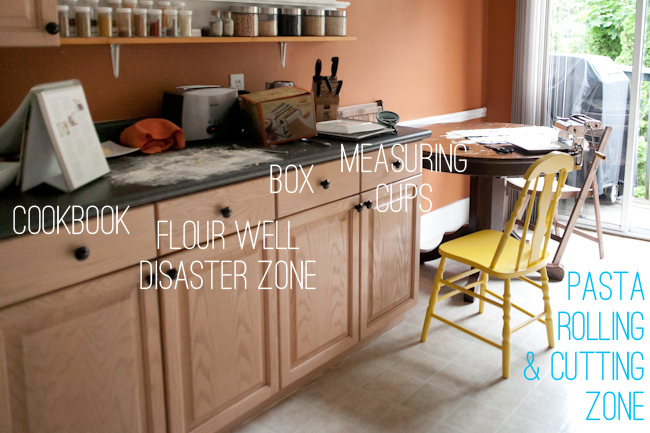 Place the flour into the centre of a clean, smooth work surface. Make a well in the middle. Break the eggs into the well. Add a pinch of salt. Start beating the eggs with a fork, gradually drawing the flour from the inside walls into the well. As the paste thickens, continue mixing with your hands. Incorporate as much flour as possible until mixture forms a mass. It will still be lumpy. If it sticks to your hands, add a little more flour. Set the dough aside and scrape the work surface clean. Set the machine rollers at their widest (kneading) setting. Pull off a piece of dough the size of a small orange. Place the remaining dough between two soup plates. Feed the dough through the rollers. Fold it in half, end to end, and feed it through again, about 7-8 times, turning and folding it over after each kneading. The dough should be smooth and fairly evenly rectangular. If it sticks to the machine, brush with flour. Lay it out on a lightly floured work surface or on a clean dish towel, and repeat with the remaining dough, broken into small orange sized pieces. Adjust the machine to the next line setting. Feed each strip through once only, and replace on the drying surface. Keep them in the order in which they were first kneaded. Reset the machine to the next setting. Repeat for each remaining roller setting until the pasta is the right thickness (usually the second to last setting). 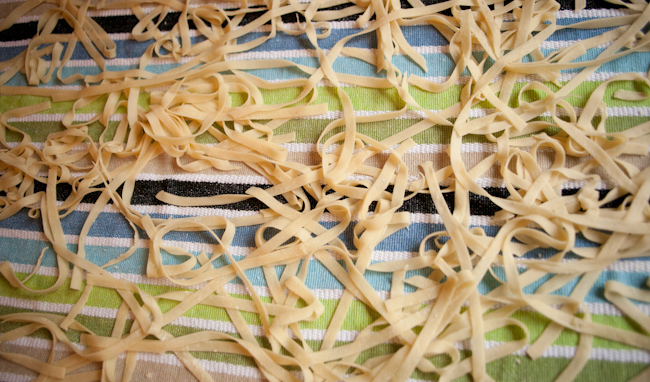 Be sure the pasta is fairly dry (but not brittle) or the noodles may stick together when cut. Select the desired width of cutter and feed the strips through. Separate the noodles, and leave to dry for at least 15 minutes before using. Bring 1.5 litres of water of water to a boil, salting at least 2 minutes before the pasta is added. Drop the pasta into the boiling water all at once. Stir gently to stop pasta from sticking together. 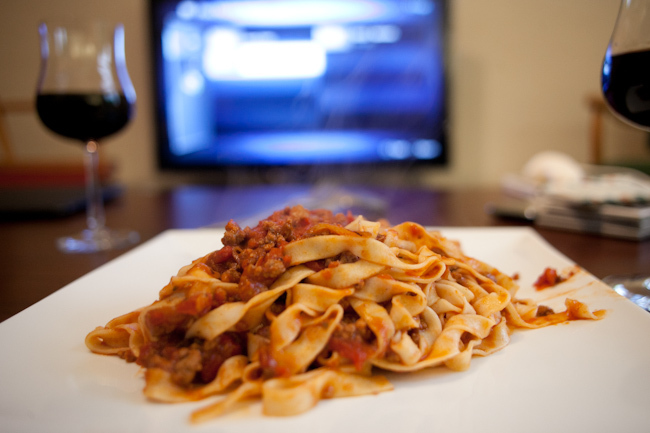 Freshly made pasta is done as soon as water returns to a boil (if stuffed, cook for 2-3 minutes). Strain and immediately toss with butter, oil or prepared sauce. Enjoy. And avoid gaining 200lbs because fresh pasta is so delicious.